A McKay premier/wallet-less photographic tour with a 3-1 Client/Instructor ratio. 12-15 clients and 4-5 instructors. We are the only company that we know of in the world, that offers a wildlife photography tour, with an instructor in EACH vehicle on Safari. Most companies offer 1 instructor to 12-14 guest. Tanzania Africa is beyond words and considered by many, to be the top photographic and travel bucket list item in a life time. With the excitement and experience of such an adventure, many of our clients on these tours ask to go back! Tanzania Africa, without a doubt, is one of the premier wildlife safari destinations in the world. After taking 2017 off from leading a tour there, we have decided to go back during one of our favorite times of the year in Tanzania. March is just after the wildebeest birthing season and a time with few crowds, prime wildlife viewing AND action taking place, and as it is just prior to the rain season, cooler mild temperatures are usually the norm. 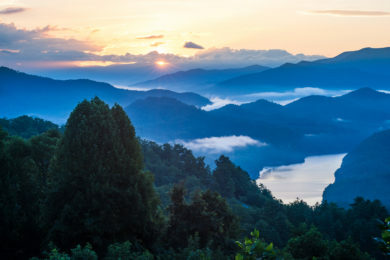 Take a look at the images above just to get a taste of some of the wildlife we will experience. Lions, Elephant, Giraffe, Zebra, Leopard, Hippo, Cape Buffalo, Rhino and MUCH MORE are ALL possibilities to not only see and photograph, but to watch in action. As we are based in the heart of the prime of the Serengeti, we have access to locate the best wildlife the world has to offer. 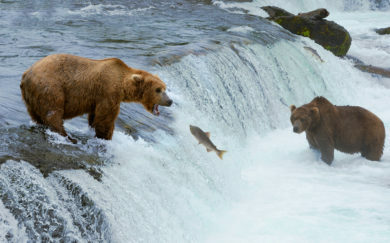 You WILL see wildlife and you WILL be blown away at it all. Words are not adequate to be able to describe what you will feel as you watch and photograph in this incredible place. Working with our personally selected group of guides we have worked with in the past, we will have the best of the best when it comes to scouts and knowledge on hand to get us to where the action is. We will leave early mornings and come back to camp late. This is NOT a run of the mill tour. This is a truly premier experience dedicated to getting you to the wildlife, and in the best positions possible to photograph it. Watch this video from our 2015 tour to get a sense of just some of what you will see and experience. This tour will be extra special. We have the ability to do some really awesome cultural exchanges as well. One of the most amazing experiences we have ever had, was the ability to meet with members of various tribes. The Maasai, the Datoga, and Hadzabe tribe will all be a part of this tour. 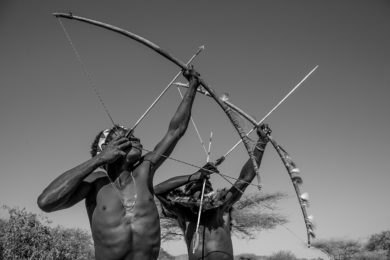 The “Hadza”, as they are known, are one of the last true hunter gather tribes in the world and eventually, will be no more. 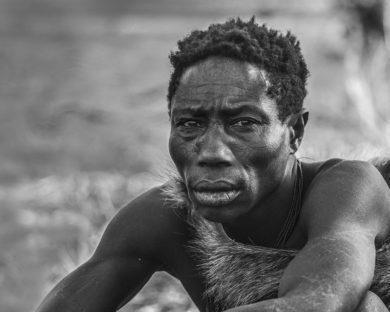 These nomads, live in the bush, and without a set home. This will truly be a life altering experience for those that go with us. The Hadza never know when we are coming. We have a guide that scouts and finds out where they are located ahead of time from the air. Then, he relays this information to our group and takes us out to join them on the day we have set. It can still take us a couple of hours just to find exactly where they are! The Hadza are VERY welcoming and love to meet new people and show them their skills. You may also encounter a tribe member that has never seen an outsider or a white person. This can be quite amazing actually! Skills you ask? Well imagine watching as they hunt and then prepare their kill? Imagine learning to shoot an arrow made with nothing but whats available of the land? One item we always let our guest know is that whether we were coming or not, this is the REAL DEAL and they would do this regardless of if we were there or not. This is what makes it so special and so authentic. You will feel like you are in a Discovery or Nat Geo Channel TV series and reality is, you basically are! 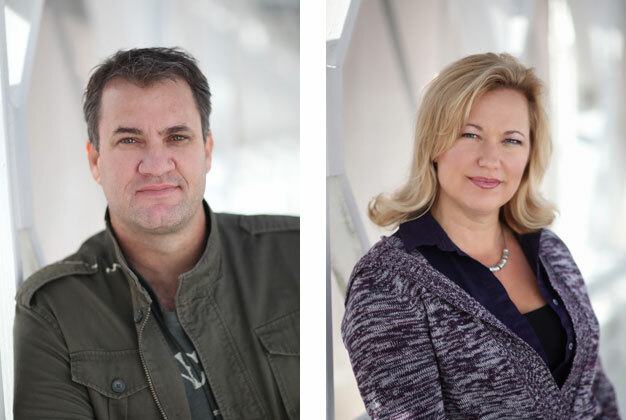 Watch this video from Toby of Photorec.tv YouTube fame. He joins us on many of our tours. This is one of his travel Vlogs from the 2016 tour! It is hard to believe that you will go to Africa and actually gain weight! BUT YOU WILL! Why? We have amazing personal chefs at our camps creating 5 star eating experiences all while we are in the middle of the Serengeti! If you have any dietary restrictions, it is no problem at all as long as we know in advance. You will find that not only will you love the atmosphere of eating together in our dining tent, food prepared, you will find the food exceptional! Also available is the “bar tent”. 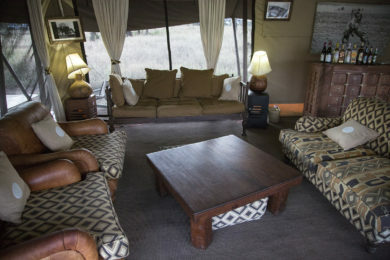 After a full day out wildlife viewing, you will come to love the tent with a bar set up and beautiful sofas, and chairs to sit and gaze out at the Serengeti from. After dinner, sit by a fire and watch the sun sink below the horizon, as we all talk of the days adventures! 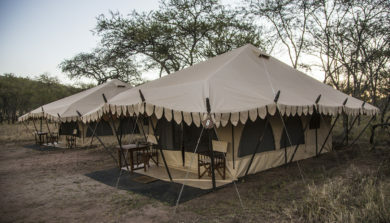 Our “Nyumba” camps are private camps set up with beautiful large tents. Now when we say tent, we do not mean a “tent” as in american terms. Rather a beautiful canvas accommodation, with full beds and temperpedic mattresses in them, as well as a sink and toilet! It takes the word “glamping” to a new level! 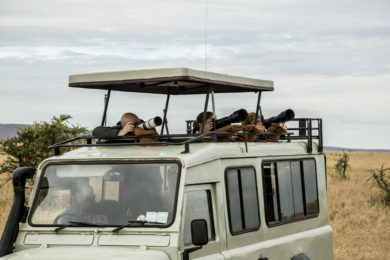 One of the worst situations we see on Safari is as we witness truck loads of people crammed into one vehicle. For photographers, this is not an option. Each customized Land Rover is limited to only 4 guest plus a guide/driver. You will have an instructor and 3 guest in a vehicle that is set to hold 9 people. This allows room for your gear and to be able to work around each other to get great shots even out the same side. This is utmost of importance!